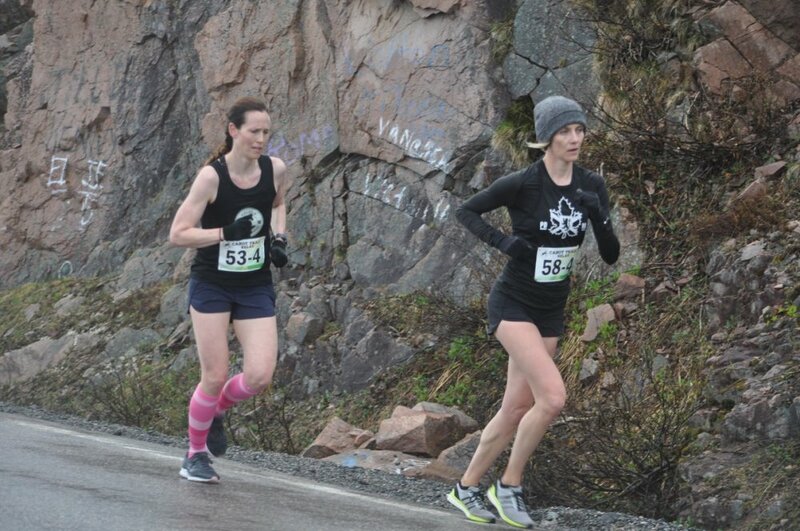 Shauna Wilcox of the Halifax Road Hammers women's team chases Nat Slomka of the Parkdale Rod Runners up Cape Smokey during Leg 4 of the Cabot Trail Relay Race on Saturday, May 26. BADDECK, N.S. 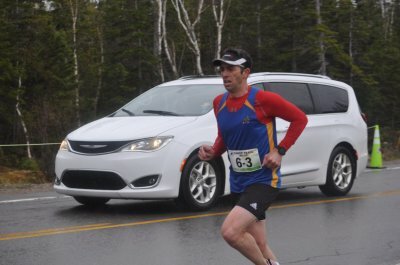 – While the toppling of The Maine-iacs for first place in the 2018 Cabot Trail Relay Race may have been the top story of the event, it was not the only one. 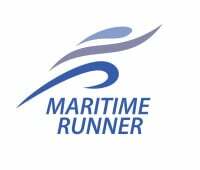 Several teams put in gritty performances, and got impressive results in return, including the top all-female team – the Halifax Road Hammers women, and the top mixed team – the Raging Bulls from Moncton, N.B. Just like he did with the winning men’s team, Road Hammers coach Lee McCarron worked very closely with the team captain to make sure they optimized each runner’s strengths by putting them on legs where they had the best opportunity to perform. Gerald Gallant of the Raging Bulls finished ninth in Leg 3. They did not have it easy. They had intense competition from other female teams, particularly the aXe Women United, a team made up of alumni from Acadia and St. F.X. universities. When the dust cleared, the Road Hammers won the 17-leg race over the aXe Women by 12 minutes. Key performances came from the likes of Shauna Wilcox, who stepped in late and placed as the third female on Leg 4, despite having been sidelined by an injury for several weeks prior; Sheila Grover, who ran Leg 1 after running the Sugarloaf Marathon only six days before; Whitney Canning, who ran Leg 14 in the middle of a busy work schedule; and Morgan Hawkes, who ran two legs, placing second female in Leg 3 and third in Leg 17. Training together as a team helped the Road Hammers, according to Benoit. 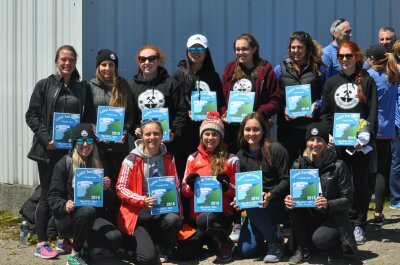 Halifax Road Hammers women: (Front, from left) Britney Benoit, Heather Lee-Callaghan, Charlotte Gardiner, Courtney Barbour, Lindsay Ozon, (back) Morgan Hawkes, Erin Carmody, Shannon Masson, Annie Li, Kali Caulier, Hilary Rawding, Sarah Masson. Missing are Shauna Wilcox, Sheila Grover, Jenna MacDonald, Whitney Canning. The Raging Bulls had set a goal to continue improving in the overall team rankings, and have done so every year since placing 18th in 2013. 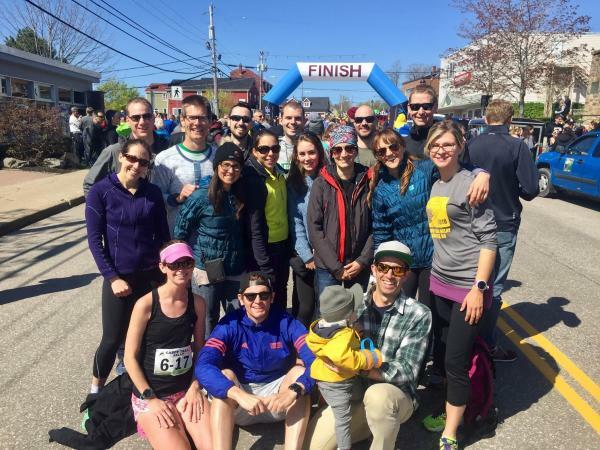 This year they finished fourth overall, and tops among mixed teams. For the relay, a team must have a minimum of seven runners from each gender, in order to be considered mixed. The Moncton team had eight females and nine males. One of those three women was Rochelle Johnston, who was the top female finisher on Leg 17, sealing the deal for her team. For complete team results, visit Atlantic Chip here . Raging Bulls: (front, fromleft) Rochelle Johnston, Glenn Myers, Gerald Gallant, (middle) Annie Pellerin, Lindsay Laltoo, Martine Cadieux, Maddy Crowell, Lise Ouellette Cormier, Heidi McLellan, Suzanne Myers, (back) Jeff Mahoney, Aaron Sellers, Adam Burke, Mitch Stewart, Marc Cormier, Nick Foster (team captain).